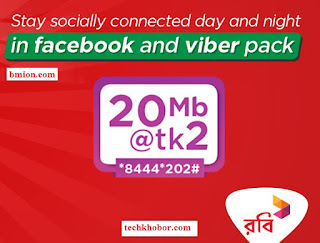 Robi 20MB 2TK Facebook Viber Social Pack! Now engage with FRIENDS everyday as you wish!!! Choose your social plans and get connected. Subscribers will get internet level usage warning in 50%, 80% and 100% level. For internet balance check dial *8444*88# OR dial *123*3# and follow the instruction. Q. Who (Postpaid/Prepaid) is eligible for the bonus offer? Q. Which pack is eligible for this using FB, Whatsapp, IMO? A. Only above listed USSD packs are applicable. Q. Is there any time band for above packs? A. No. There is no time band. Q. I have both 1GB data and Viber IMO WhatsApp pack 25 MB, If I use WhatsApp now then which data will be consumed first? A. Will be consumed from Viber IMO whatsapp packs first. Q. Can I purchase multiple pack? A. Yes you can purchase multiple times.